On the tasty side. 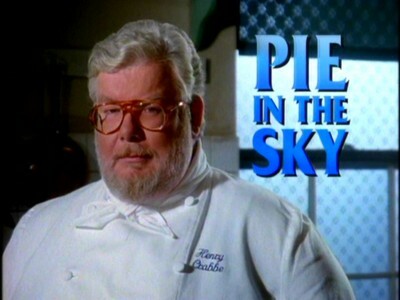 Acorn Media has released Pie in the Sky: Series 2, the 3-disc, 10-episode second season collection of the popular 1990s British detective/mystery series starring rotund, glacial Richard Griffiths (probably best known to American audiences from his Harry Potter film appearances). Extremely lightweight and sometimes preachy - yet genial - Pie in the Sky won't offer any surprises to dedicated fans of the British TV mystery genre, but you could do worse on a Sunday afternoon in front of the telly (preferably with your feet up, and a hot cup of tea and some biscuits for this cozy series). I'm coming to Pie in the Sky cold (I haven't seen the first season, and I don't believe any of my DVDTalk colleagues have reviewed it), but the first episode here, Hard Cheese, briefly establishes the series' backstory fairly well (that, and some snooping on the internet). 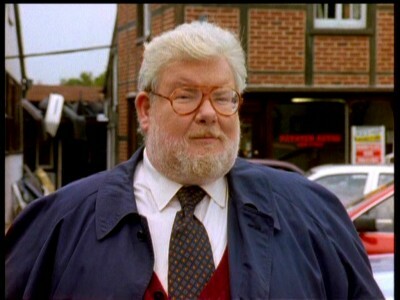 Horizontally-challenged 25-year veteran Detective Inspector Henry Crabbe (Richard Griffiths) is the best investigator on the Middleton police force. And that' s a pity, because he doesn't want to be a copper anymore; he'd much rather spend his early retirement as head chef of Pie in the Sky, the quaint little restaurant purchased by his wife, Margaret (Maggie Steed), who's not only a savvy accountant but also oblivious to Henry's culinary wizardry (she'd as soon eat a packet of crisps as one of his delicacies). 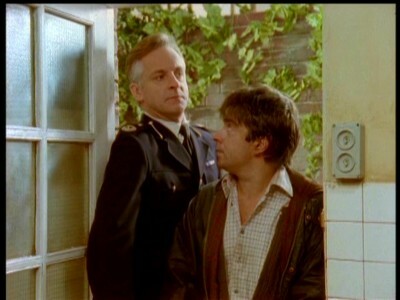 But an unusual arrangement with his superior, Assistant Chief Constable Freddy Fisher (Malcolm Sinclair) keeps Henry, unofficially, on the call sheets: it's called blackmail. Apparently, Henry botched an investigation in the previous season's opening episode, and Fisher has used this rare screw-up on Henry's part to keep him from taking early retirement. With Henry on suspension, he can't quit (because he'll forfeit his pension) and he can't retire early (or Freddy will reopen the investigation, whereby he might lose his pension). So now Henry is at the mercy of Fisher's whims when it comes to tough investigations - or sticky political situations he'd rather not deal with personally - investigations, mind you, that Fisher likes to take credit for when Henry solves them. Working with Henry during his police duties is Detective Sergeant Sophia Cambridge (Bella Enahoro), and working with Henry at Pie in the Sky are his wife, Margaret, ex-con and hot-head chef Steve Turner (Joe Duttine), looker waitress Nicola (Samantha Janus), toffy-nosed waiter John (Ashley Russell), and vegetable supplier and sometimes washer-up, Leon Henderson (Leon Raggett). I'm always on the lookout for something new (to me, at least) when it comes to U.K. television programming - particularly mysteries and detective series at which they seem to excel. So I jumped into Pie in the Sky with much anticipation. When the first episode started with that fun, jazzy sax opening, showing the cooking and law books mixed together, I had a good feeling about the series. But while Pie in the Sky certainly is modestly entertaining, it's no five-star dining experience. Trying to put my finger on what, exactly, seemed slightly...off with Pie in the Sky, I came down on its pacing, which is ponderously slow. There can be a deliberateness to this kind of U.K. series that is an attraction in and of itself; a bit of British reserve as Miss Marple and Inspector Morse close in on their prey, is as expected and welcomed as country houses, cottage gardens, and afternoon tea. By design, Pie in the Sky fits into that cozy genre nicely, but too much diffidence, combined with spotty characterizations and generic sleuthing, serves up not whimsy, but aloofness This show just refuses to move. I'm not asking for adrenaline-pumping action, by any means. But not only pacing within scenes, but overall story construction, direction and even performances, seem to have been conceived and executed at half-speed. And if you're going to deliberately slow things down, you had better make the mysteries and the characters a bit more interesting than how they come across here. The main character, chef/investigator Henry Crabbe, should be a fascinating character, and I was expecting all kinds of clever tie-ins between cookery and criminality, and delicious conflict between the demands of his unwanted police work, and the joys of working in the restaurant. But by and large, such parallels, when infrequently drawn, are one-note and obvious. Watching Pie in the Sky, I couldn't help but think of Hitchcock's last bona fide masterpiece, the nasty, ugly Frenzy, and Hitchcock's brilliant handling of the mystery elements leavened by the comedy scenes of the inspector's wife's disastrous experiments in nouvelle cuisine. Couldn't I have had something close to that here in Pie in the Sky? Shouldn't the food and the operation of the restaurant here, somehow have been worked back into the scripts, so we get a feeling for the passion for good cookery alongside the deadlier passions of murder and other crimes? For pity's sake, we don't even really have a scene where Griffiths does some cooking - how did the producers swing that (or miss it)? I must say that I found Griffiths' phlegmatic, slightly pained demeanor at first quite a funny contrast to most of these English TV detectives (almost like another fictional gourmand detective, Nero Wolf), but after several episodes, I began to suspect not intentional placidity, but real apathy on the part of the performer. I've always enjoyed Griffiths, and he's amusing here from time to time, but watch Pie in the Sky and see the definition of a performer, far exceeding his material, phoning it in. The supporting characters are taken for granted, as well, remaining steadfastly two-dimensional as they prop up the scenes in the restaurant whenever Henry is away - which is distressingly far too often. 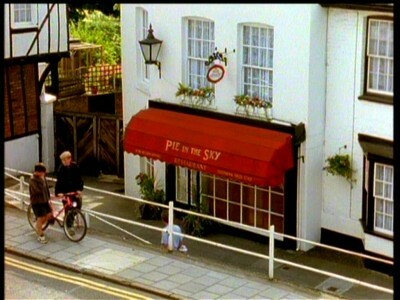 In Swan in His Pride, the episode is split up between Henry being away on a case in Bath, and his restaurant falling to pieces without his knowledge. Scenes such as pipes breaking and the cook and the waiter arguing with each other (I had to keep checking my notes to remember their names, so poorly are they drawn as individual characters) are supposed to be funny, I assume, but when we don't feel any connection between the characters because they're not really fully-drawn people to begin with, we're just marking time at the restaurant inbetween the sleuthing. And the sleuthing is no great shakes, either. Anyone with even a modicum of background in these kinds of shows won't have a lick of trouble figuring out the ins and outs of the various stock situations, while Henry's verbal bantering with sidekick Cambridge is as predictable as it is rote (Enahoro is terrible here in a smug, self-satisfied performance that mainly consists of rolling her eyes to convey smug self-satisfaction). I can't say there was much depth to Henry's and Margaret's relationship, either, when that should be the centerpiece of the series. Steed is amusing in some of her backbiting with Griffiths, but we don't really get to know her, either, so her scenes with Griffiths merely serve to move along the uncomplicated plots (some of which can be distressingly U.K. P.C. and preachy, such as The Policeman's Daughter). Reading back over what I've written so far, I don't want to come down too hard on Pie in the Sky. It may not be Midsomer Murders (what is? ), but it's genial enough, with some funny lines sprinkled throughout the proceedings (when a customer dies in their loo, Henry asks hopefully, "Oh...did he pay his bill? "), and one stand-out episode, Black Pudding, that hints at what this season might have been had it stayed focused on strong characters and an intriguing storyline. A feisty octogenarian food critic, Hilary Smallwood (Helena McCarthy, terrific), a hero of Henry's since he read her romance-soaked cookbooks when he was first starting out, contacts Henry about a distressing family matter. Her nephew has power of attorney, and he's sold her cottage and stuck her in an old folk's home, hoping eventually to possess her legendary memoirs, memoirs filled with salacious details of the once-wild, passionate food critic. Helping her (largely against her will), is longtime unsuccessful suitor, slightly batty poet and pig farmer, Seymour Flint (the marvelous Geoffrey Bayldon), who can not let go of his one true love, and who has an answer for the dreaded "food police" who wish to destroy good eating: a shotgun blast. I won't spoil the final twist of the episode, but the expert mixing of humor and tender sadness in this particular script, seems out of left field when held up against the other slightly amusing but eminently familiar episodes. This episode alone almost makes up for the other nine offerings here. A peeping tom peeps one time too many - on the wife of a senior police officer, no less - and ACC Fisher calls on Crabbe to make an arrest. Crabbe sniffs out a suspect, but the case starts to crumble after he learns that the man has more on his plate than mere peeping. 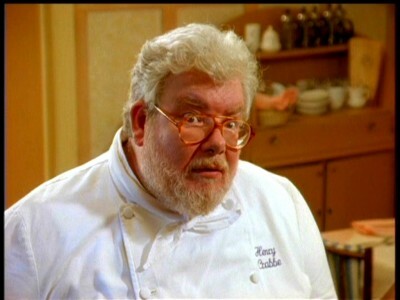 Crabbe experiences the restaurateur's worst nightmare when a customer dies in the restroom. Things get even more complicated when the body disappears. Crabbe and Sergeant Cambridge manage to track down the man's relatives, but they soon realize that the deception has only just begun. ACC Fisher orchestrates a police drug raid on a home where his own estranged daughter is partying with friends. The young woman goes missing soon after, and Fisher gives Crabbe the job of tracking her down. When an old friend is arrested for murdering his fiancée, Crabbe and wife Margaret smell something fishy. Even after the man breaks down and confesses to the crime, Crabbe suspects a conspiracy, pinning his hopes on scant evidence. A celebrated psychic starts to get death threats from an unknown source. Pressured to investigate, ACC Fisher foists the case onto Crabbe. As the detective closes in on a solution for the psychic, she in turn begins to solve a case for him. Elderly and ornery, Hillary Smallwood is a food writer whom Crabbe regards highly. Her nephew is also very admiring - of her estate, which he believes will fetch a fortune. He's desperate to get his hands on her unpublished memoirs, but she resists his efforts. When the body of a young policewoman is fished out of the river, Crabbe delves into her last assignment. She had gone undercover to befriend the prime suspect in a murder case, even becoming romantically involved with him. Crabbe's investigation, however, encounters opposition from the other detectives. Two senior citizen sisters launch a crime spree around town, aided and abetted by their nephew and his girlfriend. More of a danger, though, is a wheelchair-bound police officer, armed with a gun and awaiting the prison release of the man who shot him. 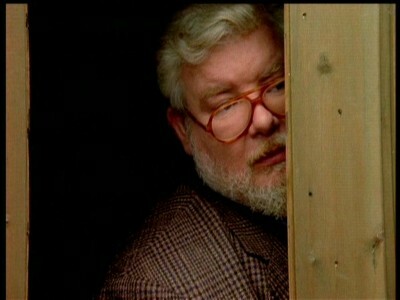 Crabbe strives to solve one crime and prevent another. When a wealthy customer's home is robbed while he and his family dine at the restaurant, suspicion falls on a young motorcycle rider. The teenager has a history of run-ins with the law, but Crabbe suspects that the burglary might have been an inside job. After a leading food critic writes a good review, business takes off at Pie in the Sky. Margaret makes a few changes at the restaurant while Crabbe attends a three-day management development seminar. However, they may pay a price for success. The full-screen, 1.33:1 video transfer for Pie in the Sky: Series 2 has a lot of video noise, with a less-than-sharp picture and okay color. Move down to a smaller monitor. The Dolby Digital English 2.0 stereo audio track is serviceable, but not impressive. Recording levels are consistent. English subtitles are included. Other than text bios and filmographies on the stars, there are no extras for Pie in the Sky: Series 2. Good for a nibble, perhaps. I can't say if Pie in the Sky: Series 2 is a downturn from the first season (could it be an improvement? ), but for what it is, it's an agreeable time-waster. 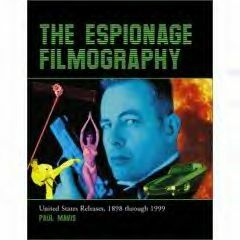 Scripts are predictable, characters are sketchy at best, mysteries are obvious, and the central premise - cooking and crime - seems oddly underdeveloped for such a promising idea. Still...Griffiths is amusing in spots, and the Black Pudding episode is sweet and funny and sad, all in equal measure, and excellently prepared. I think a rental is best, though, for the often-slow Pie in the Sky: Series 2, before committing yourself to a purchase.